This one is way out of date. 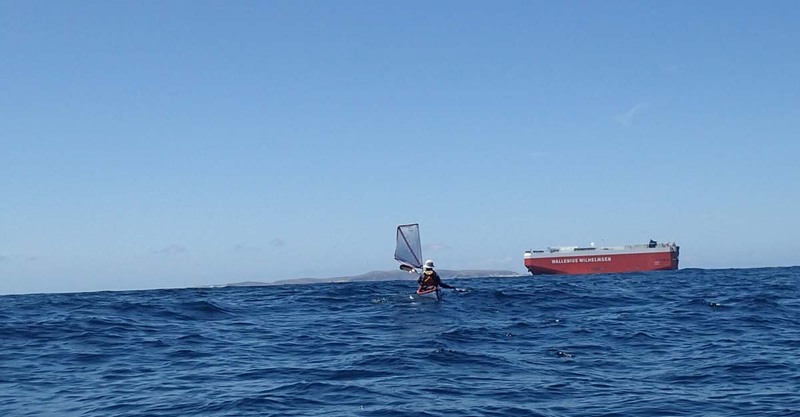 Back in December '15/January '16 I kayaked across Eastern Bass Strait with Rae Duffy and Warren Huxley. Took 20 days, and we managed to add an extra 100km onto it by doing the first ocean leg twice!. 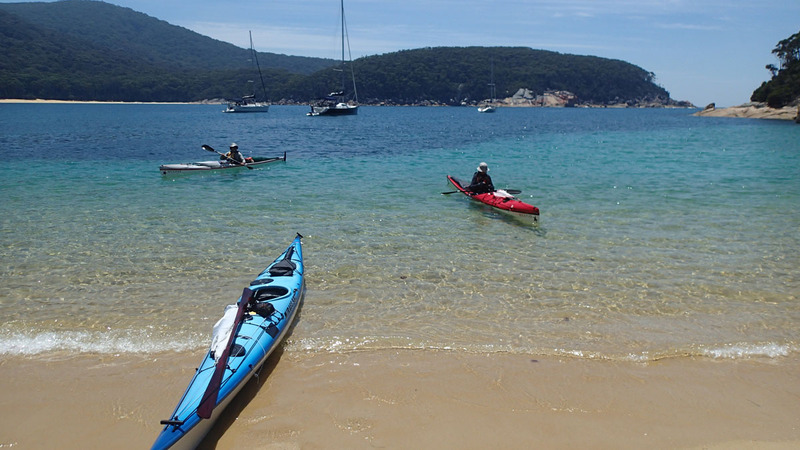 The copy below is an article I wrote for the NSW Sea Kayak Club. It was a difficult decision in some ways and in other ways no decision at all. On the first day we kayaked 42km from Port Welshpool to Refuge Cove, and next morning crossed the 50km to Hogan Island. The intention was to head on immediately the following day to Deal Island, another 44km, but events meant we were unable to paddle that day. The forecast was deteriorating: for the next five days at least we were expecting strong SE winds, and no sense of what might happen after that. Possibly the adverse winds could continue another week. 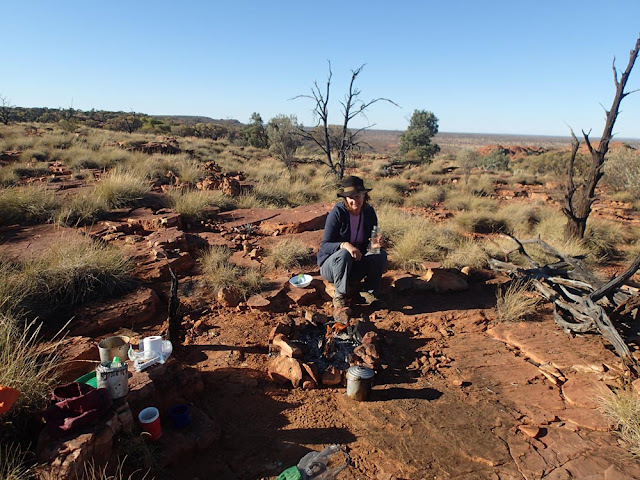 We were OK for food, but Hogan is a waterless little rock and even with the water previous visitors had left, it wouldn’t last the three of us six days with enough for a day-long ocean crossing. We couldn’t stay, we couldn’t go forward. The only real choice was to abort the whole trip or to paddle back to Refuge and hope the weather broke so we could have another crack before the food ran out. That would add 100km to a trip already over 320km. Out from Port Welshpool. World is our oyster. Rae Duffy, Warren Huxley and I had been planning the Bass Strait trip for months. I knew Rae through the club but knew Warren by reputation. To compound matters Warren had recently moved to Bellingen on the NSW north coast so he was not in Sydney often. We got a few practice paddles in, including a trip from Seal Rocks to Hawks Nest and a Hawkesbury Classic, but I felt underprepared as we strapped the boats to Warren’s roof and set out from Sydney just after Christmas. We expected to be away for three weeks. Our time limit was to be back in Sydney by February 1st. Warren and Rae were both in Rockpool Tarans and I was in my old Mirage 580, using a Greenland stick for the whole crossing. We all had sails – in my case that was almost my undoing. Heading from Welshpool to Refuge in the first day (30/12/15) we were just at the northern headland of Five Mile Beach ( still with 14km to go) when a runabout appeared headed north, with four or five blokes and a kayak on board and another kayak towing behind. They called out an alarming message: they said they had been chased by a Great White at Five Mile Beach and told us to be careful, and to stick to the surf break. Then they promptly roared off. The three of us grouped up, looking at the dozen odd kilometres left to traverse to Refuge Cove. We decided that we were safer out to sea than closer in, so we paddled in close formation for an hour or so, checking the water furiously as occasionally baitfish unnervingly erupted from the water. Rae cheerfully said sharks always come from below and behind, not the easiest place to look while paddling. The man in the grey suit didn’t make an appearance though, and we arrived without incident at Refuge Cove. 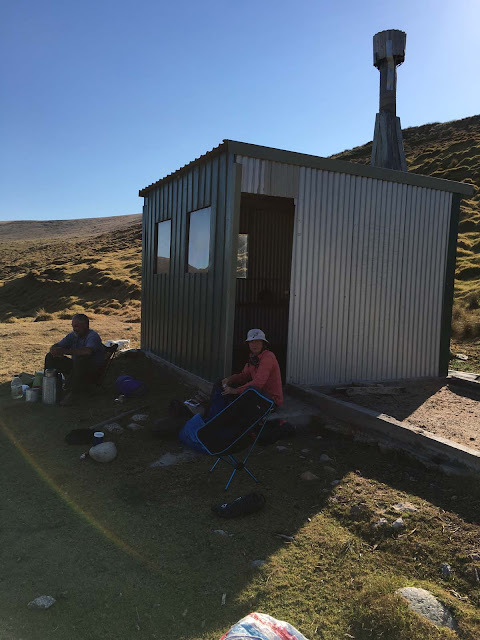 The plan was to hit out straight away for Hogan, then next day on to Deal because the weather was looking to change in three days to rising SE winds, straight in our faces. With no running water on Hogan so we packed as much water as we could, which we thought would last us a few days to get to Deal. Setting out to Hogan, the island’s invisible, 50km away over the horizon. We first caught sight of it about 36km away, by which time we were well and truly in the shipping lanes. It was a long trip out, as tides and currents turned against us in the second half of the leg and it became diabolically slow – it took nine hours. The next morning we were up at 4am to be on water at 5. Beautiful dawn as we headed off to Deal, but Warren had been ill overnight and after about 5km it was clear things weren’t getting any better for him once we were on-water. We turned back initially for Refuge but quickly adapted that to go back to Hogan. 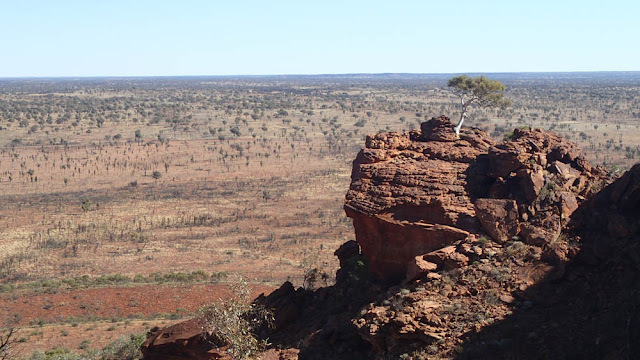 Warren recovered and rehydrated that day, and we considered our options. 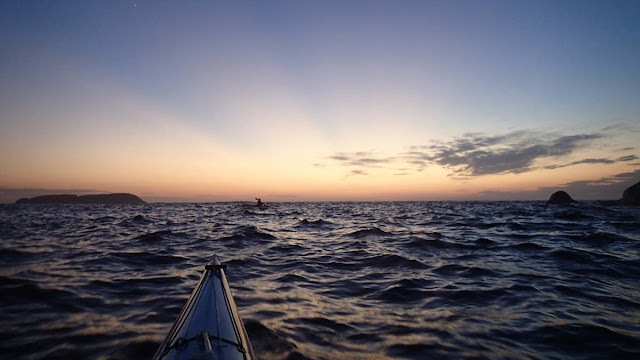 God, this is why we do it - the most amazing dawn paddle. This was a pretty depressing time. The weather forecast, as far out as we could see, looked like SE winds rising in the afternoon the next day and then staying in the 20-25knot range steadily SE for at least five days, possibly longer. We couldn’t go forward into that: and if we stayed longer we risked being stuck. There was a bit of extra water left by divers and club member Gary Roberts but even with that we would run out well before we could head on to Deal. The only water we found was a fetid green trough which the geese swam and defecated in. 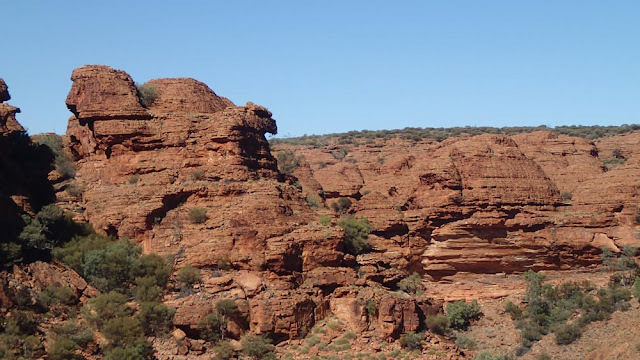 We regretfully decided to abort the trip and make a run straight back to Welshpool (about 60km), because if we lost a full week we would be at great risk of not being able to complete the trip in the timeframe – and time pressure was the thing we wanted most to avoid. Glum all round. 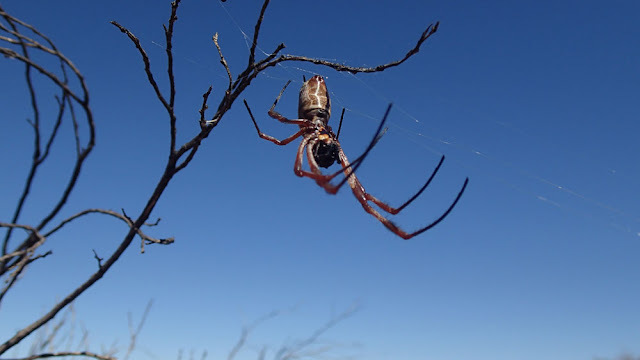 We called the local coastguard to ask about local fishermen who could drop water but they were unhelpful, referring us on to Marine Rescue in Port Phillip (despite our repeated assurances that there was no emergency and no rescue required). It looked like the expedition was over for us. We started to arrange by phone to get the car back from Melbourne to Welshpool to pick us up. Hogan hut. Home for too long. Then in a final call that evening Neil, Rae’s partner, our main ground contact, said the latest Met Eye forecast was more favourable. It was Friday now: the new forecast predicted good conditions the following Thursday and Friday. As the sun set we did some quick calculations and revised our plans. The next morning ( Saturday) we headed back to Refuge to wait out the next five days. If the weather looked good Thursday onwards we’d resume the trip – otherwise make our way back home to Welshpool. There was a light SE wind that morning but by the time we were ten or so km off the coast it had risen to a 20-30 knot tailwind with 2-3 metres seas (remember a knot is 1.85 km/h). I had a bigger sail than the other two and found that my trusty Greenland stick was abundantly the wrong tool for the job. In those conditions with a fully laden boat under full sail I lacked the ability to suddenly brace when the sail snapped to the opposite side or when a wave threatened to tip me. Heading back from Hogan. All good so far - but didn't stay that way. 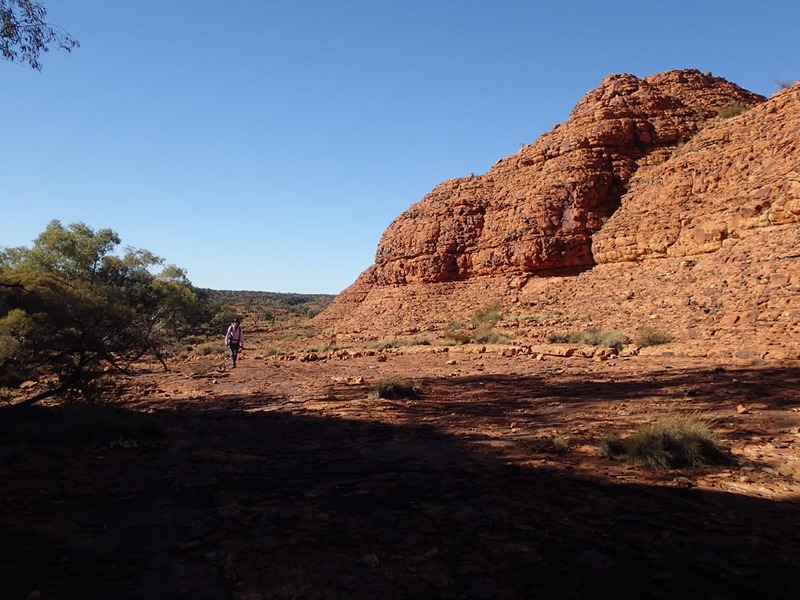 There were times I thought I was going over: tired after the 50km crossing, and with continual rapid bracing and adjustment strokes, I was rattled. Had I tipped I wasn’t sure I’d be able to roll up again in those conditions and if Rae and Warren were out of sight it could get ugly quickly. Warren was handling the conditions and Rae was absolutely in her element. We made it into the calm waters of Refuge Cove. The next four days would have passed uneventfully had I not decided to go back out with Rae to practice with the Euro blade, my spare, in stiff winds. That went well, I was feeling much more confident, but returning to the Cove I decided to do some rolling practice with the sail up. A bit rusty but things coming along until I tried an extended paddle roll. The paddle blade snapped in half at the joint. This is the second Werner blade that has broken on me, I’ll reconsider my purchasing! Fortunately a nearby yachtie, stuck waiting for a new starter motor, had spare carbon fibre and epoxy so with his help (and a whittled broom handle) I repaired the paddle, probably stronger than new but no longer a split paddle! Thank you and fair sailing, skipper of the good ship Aquaholic. The weather outlook was improving: Thursday looked benign for a crossing to Hogan , though Friday had 20-25kt westerlies. Saturday similar but lessening and the following three or four days were light NE/NW winds. Up again at 0500 and across a placid sea to Hogan. Notable encounters: a couple of big ships sailing very close to Hogan and a juvenile orca playing behind my kayak – not that I saw it! 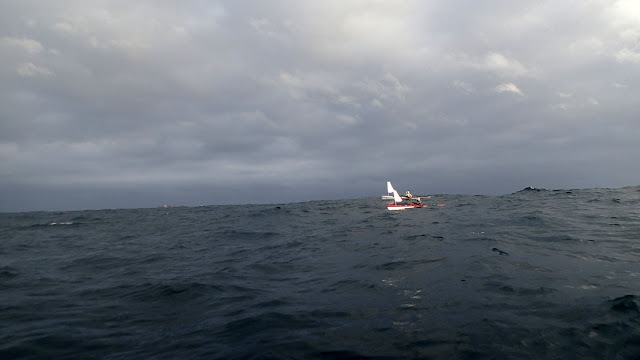 We waited out the Friday and after much discussion about the next course of action we decided not to paddle on the Saturday either, as the wind had risen, forecast 20kt at 1030, and still strong westerly (beam). We didn’t all hold the same opinion about laying over another day on Hogan, but after a long discussion decided to go with a majority decision. Three people is a tricky number for a consensus decision! In retrospect we could’ve anticipated such a situation in trip planning. We had decided that there would be no leaders, no passengers and every paddler was jointly responsible for navigation and decision-making. Still, it wasn’t an easy or comfortable call. We walked all over Hogan, Rae circumnavigated it, so there isn’t an inch of that island we hadn’t inspected by the end. 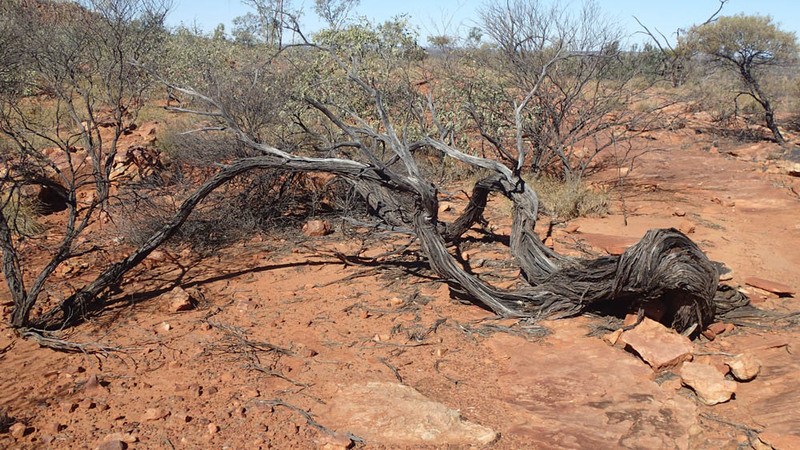 Found a few soaks which in extremis may have been able to provide water. 7 ½ hours of pretty straightforward paddling (44km) saw us reach Deal Island, all the way round to Winter Cove on the far side. Deal is beautiful, rugged and ragged, and with its spectacular attendant curtain Islands. We hiked to the lighthouse caretaker’s precinct, and had tea and scones with the two volunteers living there for a few months. Next morning, 5am start again, beautiful mackeral dawn. The 60km to Flinders was a reasonably fast trip up until the last ten km or so. The Flinders skyline from the north is confusing and we weren’t sure where Killicrankie was – it didn’t help I had my GPS calibrated to give magnetic headings but I thought it was set to true, so I was 13 degrees out! Dumb! We ended up just a few km offshore when the tide changed and we slogged into it for almost two hours. Exhausting – but made the beach after 9 ½ hours in the boats. Getting to shore at Killicrankie felt like the hardest part of the trip was done as we would be following the coast until the very last day. I won’t dwell too much on the rest of the trip, it wasn’t as eventful as the first half. 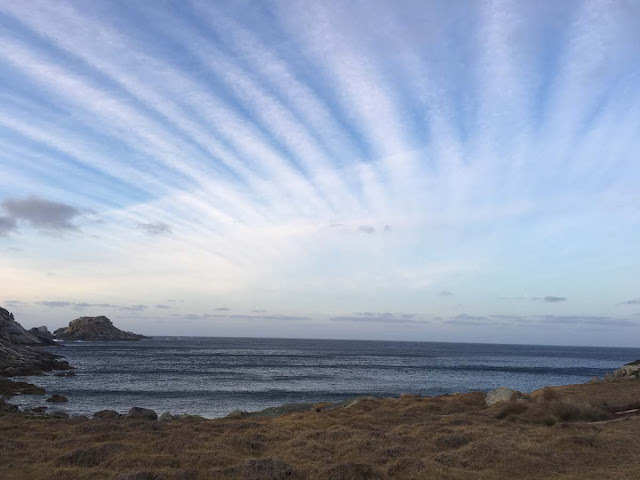 We cruised down the Western side of Flinders for the next three days, making it into Whitehaven the day before the wind came up strongly and hammered in from the west all that night and the next day. Fortunately the pub was well stocked (a huge feed, courtesy of Dee, Harry and Peter who put their card on the bar), and we hired a car for the afternoon on the second day to tour the island. After a day and a half we headed south again to Trousers Point, where we didn’t climb Strezlecki. 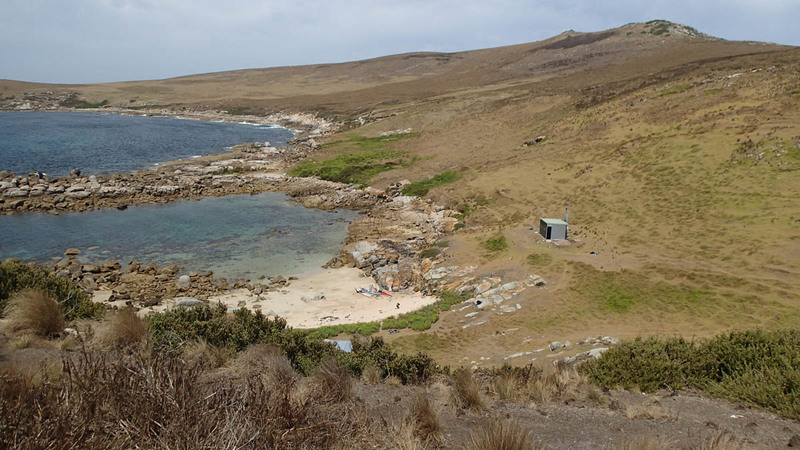 We intended crossing the Franklin Sound to camp on the southern side of Cape Barren Island. As we headed out from Flinders the peaks of Tasmania rose in the blue distance and on the way we met a mob of Victorian sea kayakers who crossed from the south for 13 days touring the Furneaux group. When we reached Thunder and Lightning Bay it was so unwelcoming and the other islands looked so close we just got back in the boats and continued, eventually landing in Spike Cove on Clarke Island via a brief look at Preservation Island. Across Banks Strait we could see the shore of Tasmania, only 24km distant, with huge wind turbines spinning slowly behind Musselroe Bay. Because we’d made up so much time with consecutive paddling days we were bang on our original schedule. Unfortunately illness intervened again, with one of our party laid low by a migraine that night and unable to paddle the next day; but it’s a very beautiful island and I don’t think any of us was in a real hurry to finish the trip and get back to that other reality. Next morning we started in a leisurely way but then decided the tides were best much earlier than we had thought, so a frantic pack and then the crossing of Banks Strait in yet another mild day. We hit the beach just before noon, meeting the indefatigable Neil, who had been our principal land contact the whole journey. Warren’s partner Merridy turned up a short while later and we cracked a bottle of bubbles. 440km travelled, 11 days paddling and 9 lay days, averaging 40km/paddling day. We managed to add an extra 100km to the normal trip by our there-and-back-again exploits. Partly because of the choices we made, we only had one difficult paddling day (well truthfully it was only me who had difficulty) and the rest of the time paddling was in absurdly benign conditions. There was effectively no swell for the entire trip, though there were big wind-fetched waves on the days we didn’t paddle. All the gear survived, with exception of my spare blade. We used the sails a lot and Warren struck a happy medium: mine was too big for strong winds and Rae’s was too small for light winds. And so that’s done. Warren and Rae were brilliant expedition partners, utterly reliable, a good mix of skills, and I think even though we had some difficult decisions to make the debates were respectful and open. Thanks to Neil especially, and to Merridy and Trine who were our land contacts, and to Dee, Harry and Peter for that feed on the first night at the pub and for all their help in the months before. 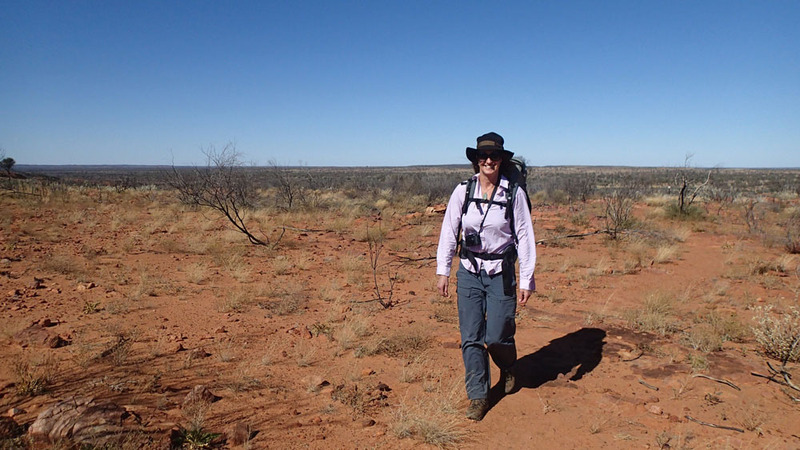 A month or so later Rae did the much more exposed Western cross south-to-north solo. Just amazing! 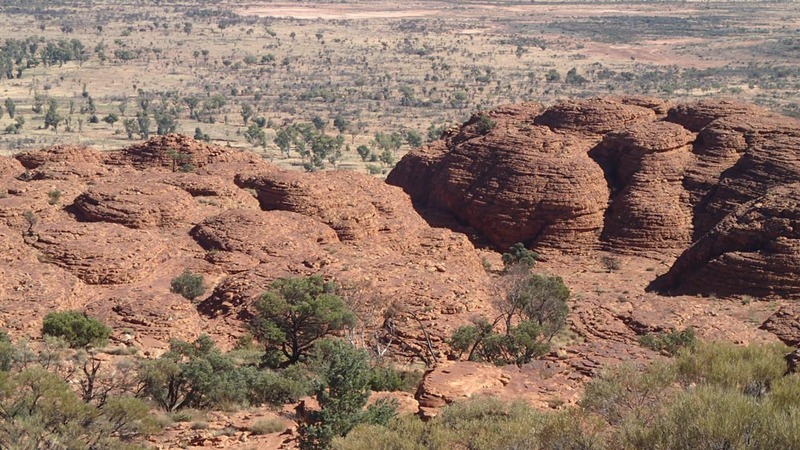 The Giles Track starts about 22k south of King’s Canyon, in the centre of Australia about as far from the sea as it is possible to get in Australia. 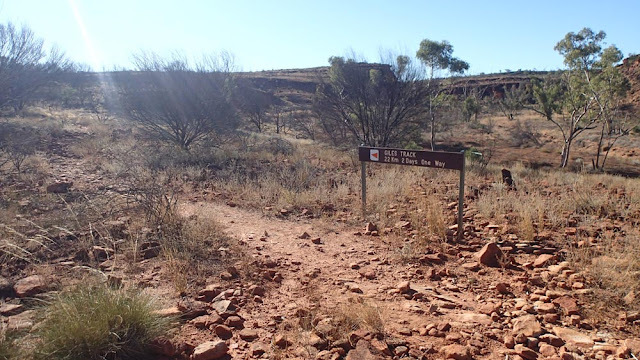 It’s one of the few formal overnight walking tracks within a few hundred K of Uluru. In truth , it’s the only formally marked overnight track south of Alice. 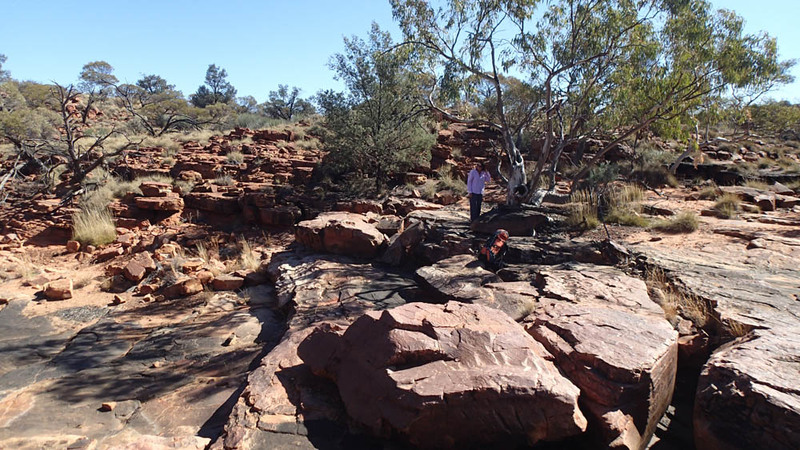 Named after the first European to explore the George Gills range, Ernest Track, it begins at one of the few permanent surface water features, Kathleen Springs ( and one can only assume she did) and ends at one of the others, in Kings Canyon. At 22k it’s a comfortable couple of days , unless you chose to do it in high summer in which case it may well be a miserable suffocating deathtrap. 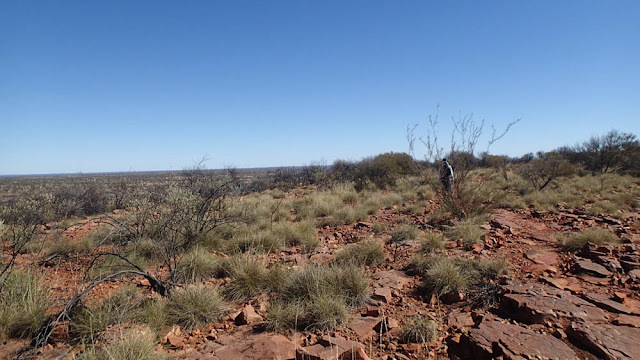 Trine and I were there in early June 2015, having planned to walk the track, and the weather was perfect: the days were hot but not exhaustingly so, and while there was no water along the track the heat was not such that we ever faced any issue with the amount of water we could carry. The track is pretty unprepossessing at the start, winding almost apologetically up from the Visitor Node at Kathleen Springs (what even is that?) onto the escarpment. And that escarpment is where you stay for two days. Headed northbound, it’s rare that you don’t have the land dropping away swiftly to the left and an desolate scrubby sandhill plain extending off into the infinite distance. The track itself is straightforward with not a lot of elevation changes. There are a couple of dry creek beds to cross, which are beautiful with notable drifts of flood debris high in the parched trees. Somewhere around the misnamed reedy creek ( it has neither) we started looking for a camp spot. 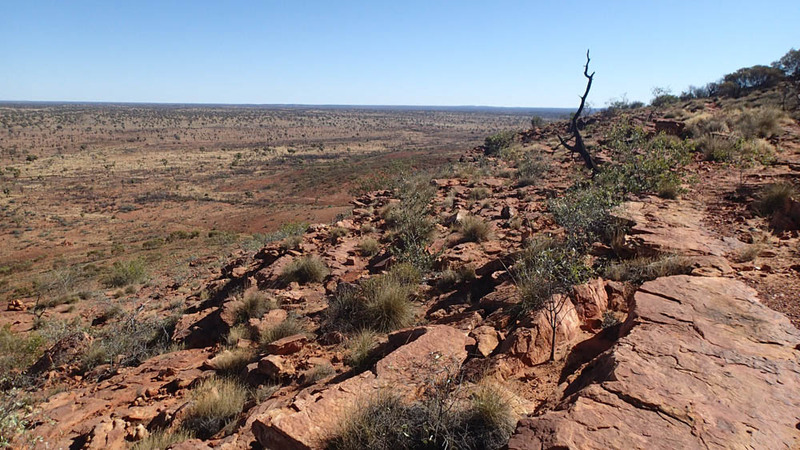 You can camo anywhere between the 3km and 20km markers, so we found a spot overlooking the plain with ample dry wood and rock platforms that would provide containment to a small campfire. 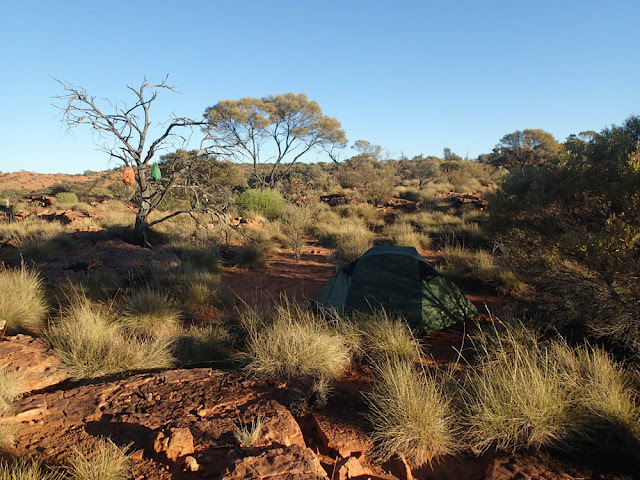 A phenomenal night under a clear sky roaring with stars, with dingoes calling in the distance and the wind sighing in the hill mulga. Second day was much like the first until we started to get into the beehive country just south of Kings Canyon. 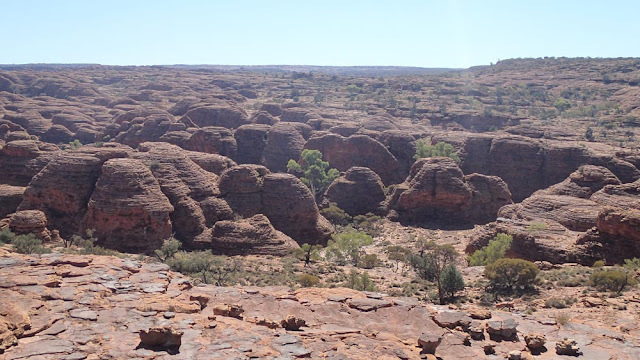 These formations are fractally self-similar to the much smaller patterns of the sandstone sheets we had been walking on: huge grids of intersecting cracks eroded over time to produce dome-shaped formations seemingly built from horizontal layers. We met a ranger as we approached the canyon, who said that it was unusual to see people on the track from month to month. In a log book halfway along the last entry was in April: we were there in June. We certainly saw no sign of other walkers. 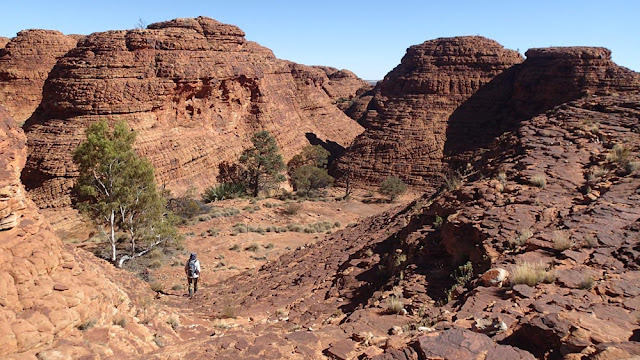 Eventually we arrived back at the spectacular descent into the Kings Canyon Visitor Node ( what even is that) where the chatter of the day trippers carries far into the quiet hills. And it is as far as you can get from the sea in Australia, did I mention that? 25 years in a kayak, many more on skis. Based in Sydney in Australia, I live on the harbour and have the wilderness of the sea at my doorstep. Copyright 2011 Ian Vaile. Picture Window theme. Powered by Blogger.